This is something of a miraculous find. 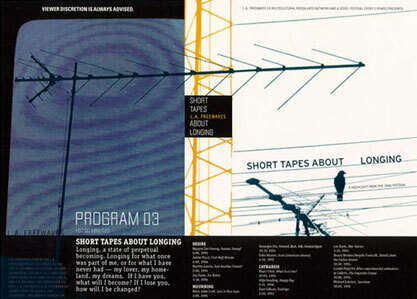 It is the cover of the Program 04 VHS tape distributed to art centers and libraries throughout Southern California in 1998, by L.A. Freewaves, which is headed by Anne Bray. The tape featured the set of short art films which were grouped together by Freewaves under the rubric Urban Myths and Legends - named as such at least in part due to my film El Angel being included (I'd like to think) - as El Angel depicted a personification of Los Angeles battling an equally personified Urban Decay. I had never seen this image, and - to my great surprise and delight - only discovered it yesterday. Thanks to the kindness and generosity of Bret and Happy Banta - two very talented and well-known L.A. designers - I now have the above high-resolution copy which I can archive on my site. I've also uploaded it to Archive.org here. Following are further scans of the 1997 Freewaves tape covers and 1998 Freewaves catalog which were distributed to art centers and libraries throughout Southern California. My Monograph at Four Major Museums!